In our previous post, we looked at how to get started with Openstack using Ubuntu Cloud's Live CD in VMware Workstation. 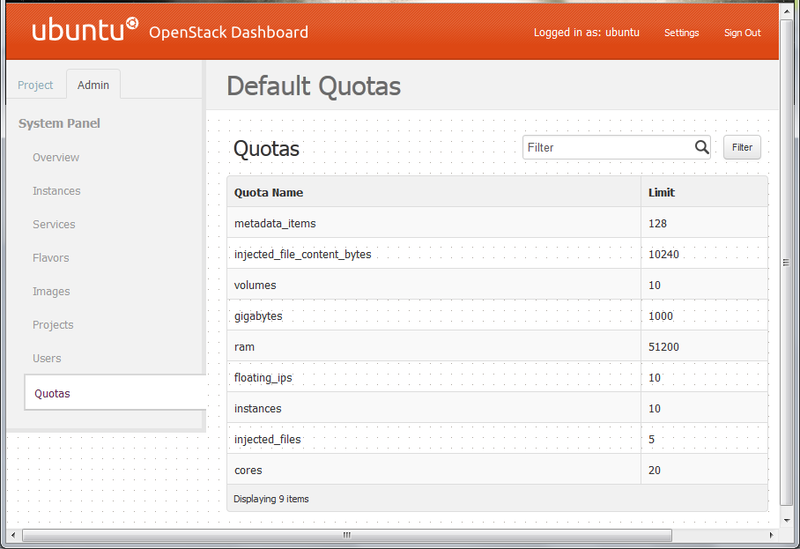 In this post, we are going to actually install and configure Openstack out. NOTE: These installation steps are ONLY meant for Ubuntu Cloud's Live CD and will not work on other OS's or Openstack distributions. 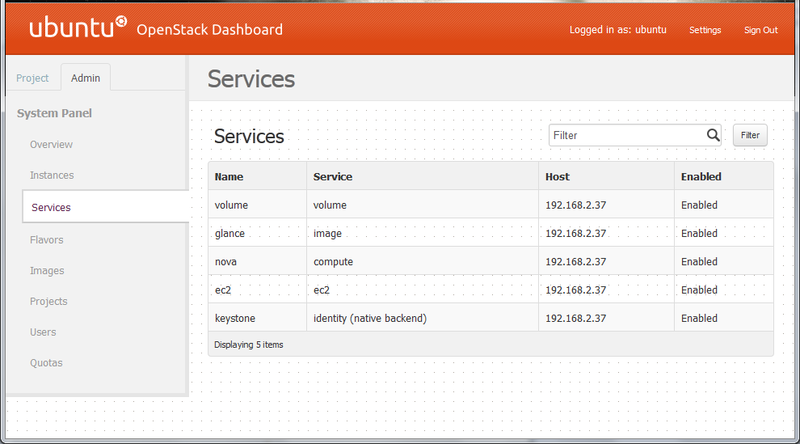 This is just for exploring Openstack in a quick and easy manner. 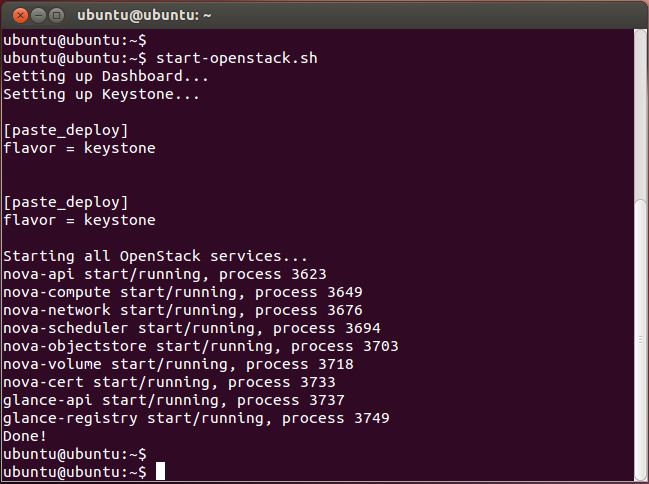 All the instructions to get Openstack up and running are placed in the "GettingStarted.txt" file on the Desktop. Below, in the following steps, I'll be quoting the steps from the same guide. This script will essentially create a MySQL database that will be used by Nova for storing configuration information. Unless something goes wrong, there will be no output from this command, and it may take a few seconds to complete. IMP NOTE: At this point, you need to make sure you have IP set up on your Ethernet interface (eth0). NOTE: This demo assumes you'll be using eth0. If you'll be using some other ethernet interface please adjust /etc/nova/nova.conf and ~/bin/start-openstack.sh. Once your network is set up, it's time to start nova and glance services. 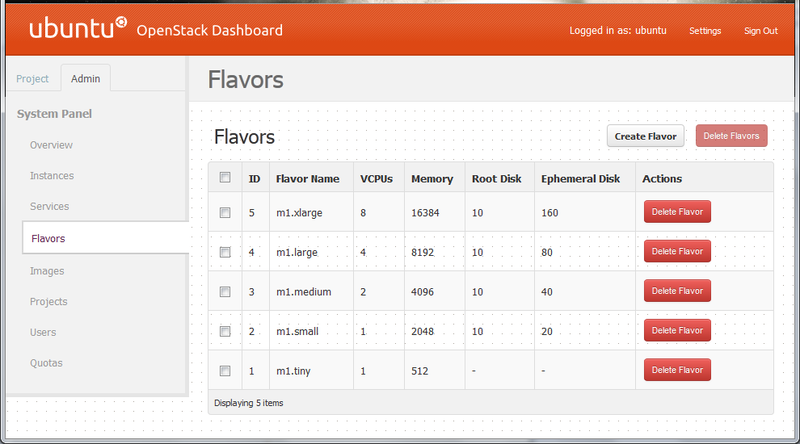 If there are no errors (as shown above) then you are now ready to start exploring your Openstack Cloud !! 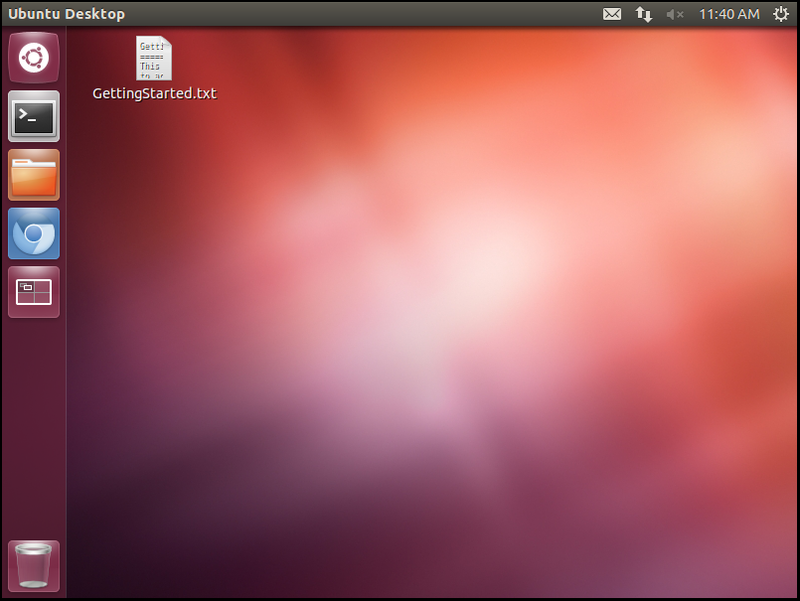 Launch a Web Browser and type in the IP address of your Ubuntu VM. 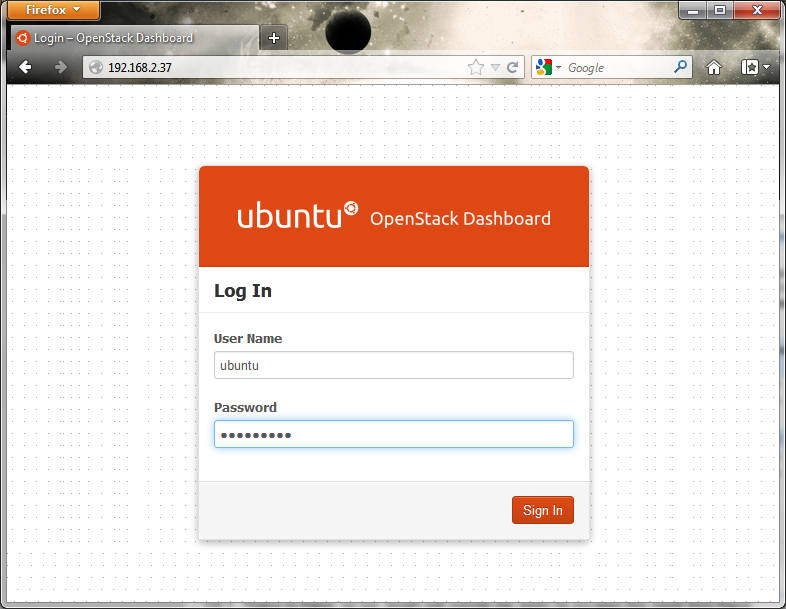 You will be provided with a Openstack login page. Log in as 'ubuntu' user, with 'ubuntu123' password. 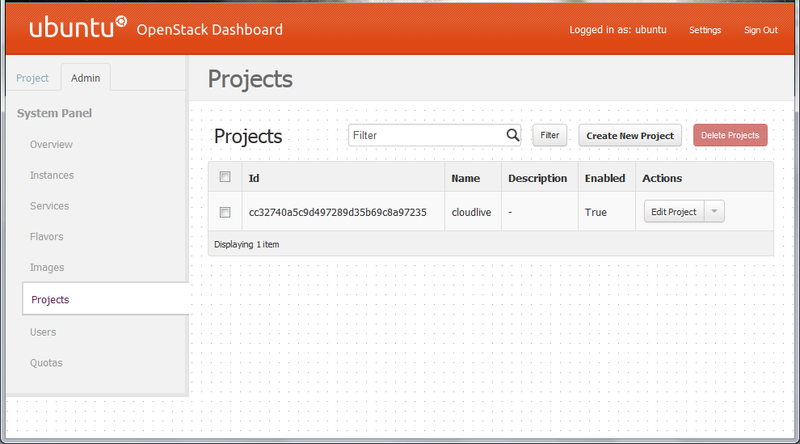 This basically provides an Overview/ Usage summary of your Cloud's resources per each Project. 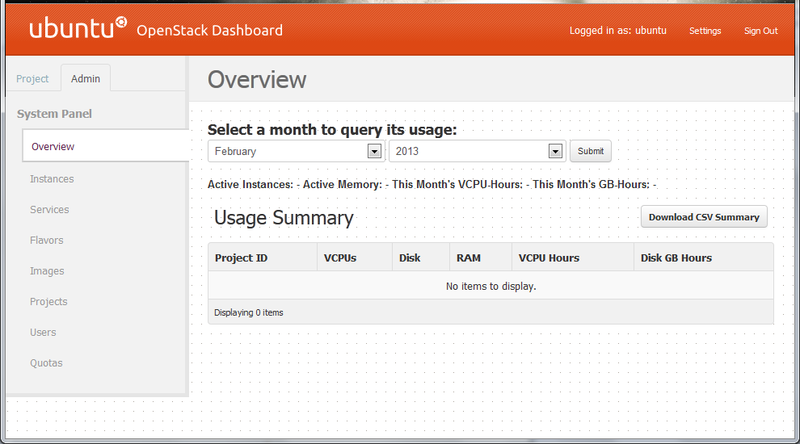 You can view details of your Cloud's consumption once you start launching instances and volumes. Here, you can view the status of your Openstack Services, whether they are up and running or not. Here, you can create your custom VM flavors; aka sizes and configuration, using which your Cloud users will launch instances. Basically you can configure a per-defined set of virtual CPUs, RAM and Disk specification using which instance will be launched. 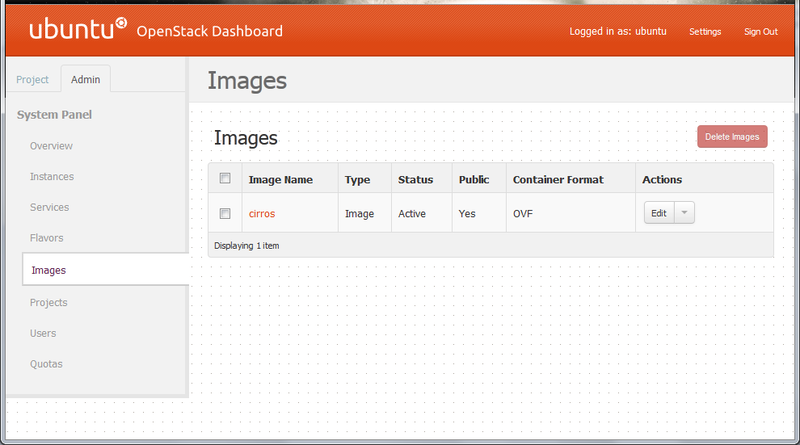 The Images tab will show the list of VM Images that you can launch your Instances out of. Think of 'Images' as a 'VM Template'. By default there will be no Images to display. But Ubuntu Cloud Live CD has bundled a small image (cirros) into the distribution that you can use to launch a test instance out of. 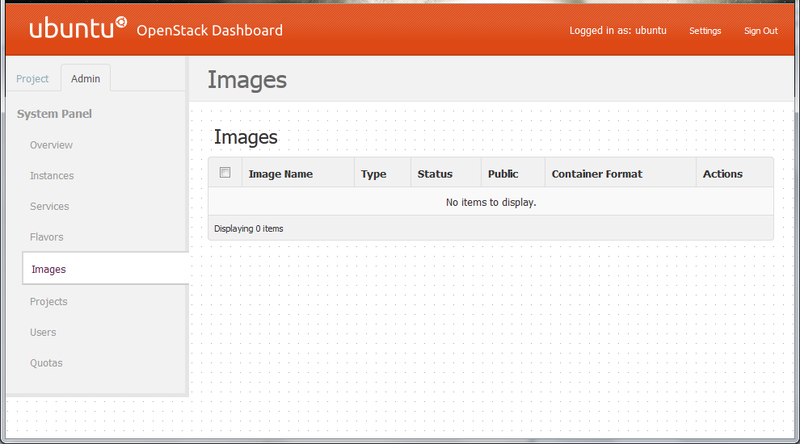 Once uploaded, refresh the browser and you will see the Image added successfully to Openstack. This tab is useful for create different 'Projects', each of which can have its own set of users and quota of resources to consume. This is basically more of an administrative feature so that the Cloud Admin can allocate resources to each Project and then bill them (charge-back) according to consumption. This tab will help the Cloud Administrator set the quotas/ limits for a variety of resources such as volumes, RAM, number of instances etc. These values can be altered as per requirement of each 'Project'. 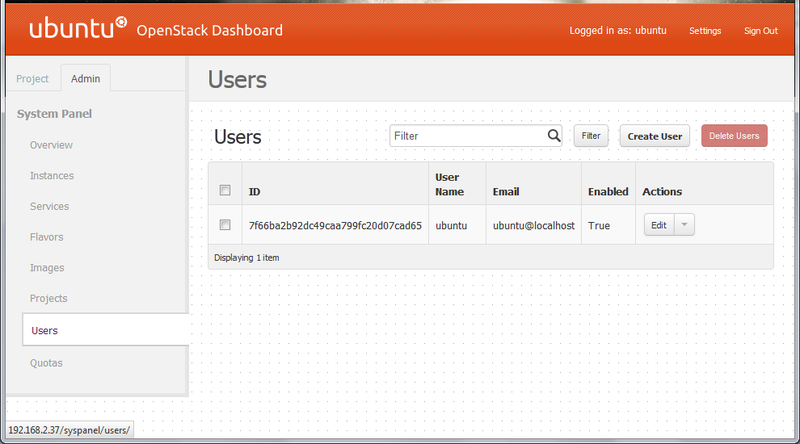 With this, we have successfully installed Openstack on our test Ubuntu system. In our NEXT PART, we will be demonstrating the steps of actually working with Openstack; including creating your own Projects and users, creating key pairs, security groups and including launching an instance..